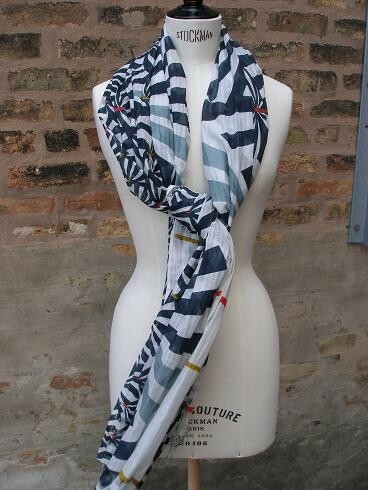 A scarf by Epice, one of the labels featured at Tula's Summer Accessories Bazaar this weekend. Today local designer Abigail Glaum-Lathbury will be at Workshop, 818 W. 18th, with her new line, Elmidae—which starts at just $25—as well as sale items that are up to 85 percent off. Up north in Bucktown, Robin Richman is reprising her popular Swap and Shop event—bring gently used designer clothes, shoes, and accessories tagged with prices and on hangers. All S&S transactions are cash only. It's from 5 to 7. Clever Alice holds a sample sale that kicks off Thursday and runs through Sunday. Check out French and American labels MC Planet, Eva Kayan, Sathia, and Porto. Friday through Sunday, Tula holds its annual Summer Accessories Bazaar in the courtyard in front of the shop. Browse warm-weather finds such as scarves by Epice and Bindya and jewelry from Lulu, Wendy Mink, Sheila Fajl, Carol Workinger, and more. Friday night, Akira hosts ShopAKIRA 2.0, featuring "intereactive displays of the newest website features," stylists to help guests pick out ensembles, photographers to capture them, and a runway show. It starts at 7 at Griffin Lounge, 326 W. Chicago. It's free but you must be 21 or over. RSVP to events@shopakira.com or call 312-324-0348.